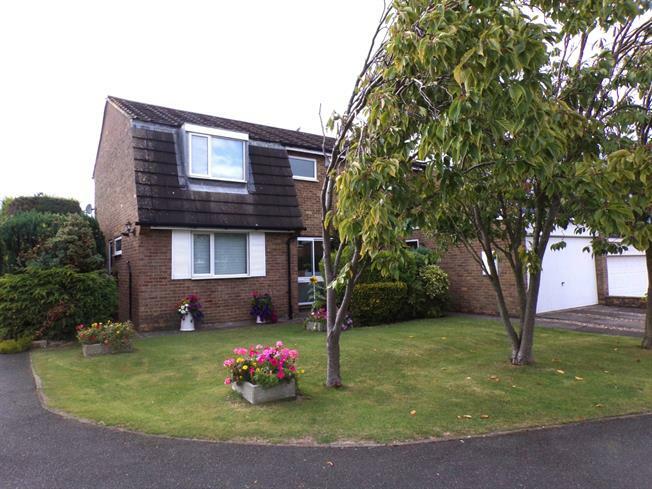 4 Bedroom Detached House For Sale in Yarm for Fixed Price £295,000. This delightful home has two spacious receptions rooms, with large windows and patio doors to the rear, offering lovely views of the secluded gardens. The generous kitchen/breakfast room opens into a useful utility room. Upstairs, there are four good size double rooms, including an impressive size master bedroom, with a contemporary en suite shower room. The family bathroom has recently been updated, and now features a stylish back to the wall roll top bath..
With sliding glass entrance door and wooden framed door leading into the hallway. Ceiling light. Spacious and welcoming, with doors to leading to all ground floor rooms. Large under stairs storage cupboard. Coving and ceiling light. Benefitting from a floor to ceiling window to the front and large sliding patio doors to the rear, this bright and spacious room enjoys lovely garden views. Feature mantle piece with marble surround and hearth housing a coal effect open gas fire. Coving and ceiling lights. Double doors opening into the dining room. An elegant room, with a floor to ceiling window and French doors leading out into the rear garden. Double doors opening into the living room. Ceiling light and coving. Providing a generous range of cream wall and base units with contrasting wood effect work tops. Integrated oven, double oven and grill, halogen hob and extractor hood and fridge. Window to the rear and stable door to the side. Fitted breakfast table. A sliding door opens into the utility room to the front. Featuring work tops with space and plumbing below for a washing machine, tumble drier, dish washer and freezer. Wall mounted Vaillant boiler, recently installed. Ceiling light. Window to the front. Recently re fitted with wash hand basin set into vanity unit with storage and low level WC. Ladder heated towel rail, laminate flooring and ceiling light. Frosted window to the side. A fabulous sized room, with large picture window to the rear. Range of fitted furniture including two double wardrobes, dressing table and several chest of drawers. Coving and ceiling light. Door to en suite. Contemporary suite consisting of double step in shower cubicle, sink set into vanity unit with storage, WC and bidet. Ladder heated towel rail. Spotlights and coving. Part tiled walls and Karndean flooring. Frosted window to the front. Single built in wardrobes offering storage. Coving and ceiling light. Window to the rear. Large airing cupboard with hot water tank. Single built in wardrobe. Window to the rear. Spotlights and coving. Single built in wardrobe. Ceiling light. Window to the front. A delightful room, with suite comprising of a back to the wall roll top bath with shower attachment, pedestal sink and WC. Ladder heated towel rail. Part tiled walls and Karndean flooring. Frosted window to the front. Offering access to all first floor rooms and into the loft space via a ladder. The south west facing garden to the rear is mainly laid to lawn, with borders to the edges brimming with mature trees and shrubs, providing interest and colour throughout the year. Sandstone paved patio with path leading though gated access to the front. The front is lawned, with a double driveway leading to the double garage. With an up and over double door to the front, and single up and over door to the rear, leading to an area of hard standing. Pedestrian door to the side. Range of wall and base units providing storage. Light and power.